TEHRAN, Aug. 10 (Xinhua) -- A passenger plane crashed on the outskirts of Iran's capital Tehran on Sunday morning, killing 39 passengers and injuring nine others, state IRIB TV reported. The Antonov-140 (also Iran-140) of local Sepahan airlines, bound for Iran's eastern Tabas city, crashed after taking off from Tehran Mehrabad Airport at 9:45 a.m. local time (0515 GMT). Earlier, local media reported that all 48 people on board, including 40 passengers and eight crew members, had been killed after the plane crashed in the residential area of Azadi town, just 5 km to the west of Tehran. Those who were killed are not identifiable due to the severe burning injuries, and they will be identified after DNA examination, state TV channel said. An eye witness told Fars news agency that he saw the plane was divided into two parts after it hit the concrete wall. The tail separated and fell down the street near Mina glass-making factory in Azadi town. Failure in one of the plane's engines caused the plane to crash on the northern side of Tehran-Karaj highway, semi-official Fars news agency quoted Mohammad Ilkhani, the head of Iran Airports Company, as saying. "The pilot had informed the control tower of an engine malfunction as he was taking off, but communication was lost as the plane crashed," Ilkhani said. In a test flight of an Antonov-140 in December 2002, at least 44 people, including 40 passengers and flight engineers, were killed when the plane was preparing to land in an Isfahan airport in central Iran. Also, in February 2009, another Antonov-140 crashed in Iran's central Isfahan province while the crew were on a training flight, leaving five pilots killed. "No flight permission should have been issued to this plane," the Iranian lawmaker Mehrdad Lahouti said in a parliament meeting on Sunday, according to semi-official ISNA news agency. 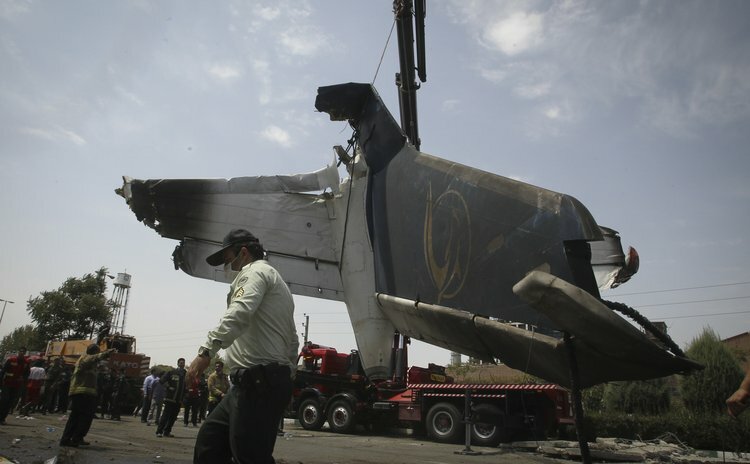 "The first plane of this type had been crashed in Isfahan" several years ago, Lahouti said, adding that the Iranian lawmakers, who had visited the construction process of this plane for two times, had expressed their concerns in this regard. On Sunday, the Iranian Majlis (parliament) tasked its Construction Commission with the necessary measures to investigate the plane crash as the Ministry of Road and Urban Development assigned its own special committee to probe into the crash, said Tasnim news agency. Also, Iranian President Hassan Rouhani ordered on Sunday all the flights of the Antonov-140 to be suspended before full investigation into the accident will be carried out, the official IRNA news agency reported. He also urged technical standardization of all the passenger planes in Iran. The black box of the plane was found which will be of help for investigating the cause of the accident, IRNA reported quoting the Deputy Minister of Road and Urban Development Ahmad Majidi. Iran has seen several air disasters involving both civil and military use aircraft in recent years. In the latest incident in January 2011, an air crash near the airport of the northwestern city of Urmia killed 77 people, including four foreigners. Experts said the U.S.-imposed sanctions against Iran, which prevented its allies from selling aircraft or aircraft parts to the country, have undermined safety standards within Iran's civil and military aviation fleet with the likelihood of further air disasters.